An intriguing analysis of the American war in Vietnam, as seen through the prism of the North Vietnamese supply line known as the Ho Chi Minh Trail. When historians examine the crucial military engagements of the war, they usually focus on the 1965—68 Rolling Thunder bombing campaign, the 1968 Tet Offensive, the 1968 siege at Khe Sanh, the 1970 incursion into Cambodia, the 1972 North Vietnamese Easter Offensive, and the so-called Christmas bombings of 1972. But Prados, the author of a history of the National Security Council (Keepers of the Keys, 1991, etc. 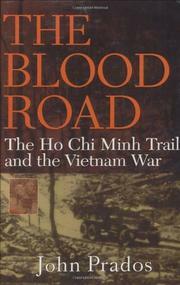 ), makes a convincing case that the building of, North Vietnamese use of, and American and South Vietnamese attacks on the Ho Chi Minh Trail instead constitute the most important military aspects of the war: “The Trail serves as metaphor and microcosm.” Calling this 12,000-mile network of roads and paths the North Vietnamese “highway to victory,” he characterizes the trail as the “fulcrum” behind the 1975 North Vietnamese win. “By any standard of human endeavor and achievement, what happened on the Ho Chi Minh Trail must rank high among the works of men and women,” he claims. His well-researched, readable book contains impressively detailed nuts-and-bolts descriptions of how the trail was built and maintained. Prados also covers territory far removed from it, including analyses of Kennedy’s, Johnson’s, and Nixon’s Vietnam decision-making; Lao political machinations; US covert operations in Cambodia and Laos; the antiwar movement; and the impact on the war of the Soviet Union and China. Prados brings most of these analyses to bear on the American war effort in general and on the Ho Chi Minh Trail in particular. One main reason the US lost in Vietnam, Prados concludes, was “Hanoi’s ability to sustain the Viet Cong [in South Vietnam] in the face of [US commanding Gen. William] Westmoreland’s attrition operations.” The Ho Chi Minh Trail, he says, “made that possible.” An original account of the Vietnam War, interpreted logistically.